Explaining the difference between the Powerbox, Trimbox, Classic box and Tuttle box fin systems used nowadays. Chinook Slot (referred to as an “A” box if it’s design depth is 2.5 cm or approx. 1″ and as an “E” box (for European) if it’s design depth is 3 cm or approx. 1.25″. The Tuttle box has straight sides and the root is a uniform 1.60 cm (.625″) and the “fit” is supposed to be quite tight on the sides. The depth is set by the angles on the front and rear of the fin root. If your fin will not go all the way into the box until the root of the fin is even with the bottom surface of the board or finbox, then you need to file or sand the radius’s on the front and rear of the fin to allow it to go further into the box. You do not want to alter the width or “thickness” of the root unless you are sure it’s oversize. The fin gets most of it’s support from the close fit between the sides of the fin root and the sides of the fin cavity in the board. The “Deep Tuttle” configuration is the same width on the sides, but the fin root is much taller (deeper), measuring 7 cm (approx. 2 3/4″) at the same point on the root that your std. Tuttle measures 5 cm. The front and rear angles and radius are the same for the std. and deep Tuttle, the major difference being the extra 2 cm of root “height”. The Powerbox is a system using a root with both tapered sides and tapered front and back. It’s most commonly found on mid size boards from F2 and Mistral. On the wider race boards, both of these manufacturers have adopted the stronger Tuttle or Deep Tuttle system. The Trim box, was designed by Bic and features straight sides, and the ability to move the fin forward and aft in the fin box, by sliding some plastic spacers to be either in front of the fin, some in front, some behind, or all of the spacers behind the fin. It’s a pretty strong finbox, but even Bic uses Deep Tuttle boxes in their wide race boards. Smaller wave and Bump and Jump style boards often use an “A” box because they are much thinner in the area where the fin mounts, and they are designed to use small fins as they are for waves, jumping, and radical maneuvers where a big fin would only cause problems. These boards typically use fins < 30 cm (12″) in span. Slalom boards in the 90-130 liter range usually come with the std. depth Tuttle, the Powerbox or the Trim box as they are intended for use with fins in the 28-48 cm range. Both the Powerbox and the Trimbox are strong enough to handle fins up to about 50-52 cm. Beyond that, and you need a Tuttle box for really good fin/finbox integrity. The Std. Tuttle Box can handle fins up to about 58 cm with good results, but for racing use and larger span fins (i.e. > 58 cm) the Deep Tuttle is the way to go. But these boards are usually very wide and quite thick in the finbox area to accommodate the deeper fin root. Std. Tuttle fin roots fit nicely in deep Tuttle cavities if you can find screws long enough to secure the fin. The inserts in the Std. Tuttle root will be 3/4″ further away from the top surface of the board. Deep Tuttle fins WILL NOT fit in std. Tuttle boxes, for the obvious reason that the root would stick up out of the bottom of the board at least 2 cm (3/4″). But there are down sides of putting a standard tuttle into a deep tuttle box. 1) The long screws transfer the load to the screw heads and even with thick rubber washers they can/do/have cracked the deck above the box. 2) These long screws can pull the std Tuttle up into the box causing the box to overflex and crack the board and box. 3) Assuming you don’t over tighten the fin and cracking either the box or the deck. We also experienced deflection in the screws. Causing them to bend in the unsupported area. Making removing the fin impossible (as well as retightening). So here a photo of mine. I’ve found it challenging, but it works. I like Mike Burns’ suggestion of the fin being wrist to middle finger length (kind of like harness lines being elbow to wrist length) but my fin is too short for that. Freestyle Fins: How Small is Too Small? Consider these two fins. Both are attached to JP 109 Freestyle boards. One fin and board belongs to me, the other to freestyle lunatic (and ABK-meisterAndy Brandt. See if you can tell which is which. Whenever I’m around serious freestyle windsurfers, the thing that stands out most about their gear is their fins. They’re all “modified”. Modified” is a polite term…they’re amputated fins. They are preposterously short. What about commercially available freestyle fins? “Too big” everyone says. “You have to make your own!” Long Island’s Mike Burns has been seen sailing on a cut down wave fin. I can’t quite make out what the nub that Mr. Brandt is on was before it was cut away. It seems to me that fin manufacturers could do well for themselves by charging full price for these half-fins. In the meantime, the next time you wreck a fin, just cut away the bulk of it, and celebrate your new piece of gear…you’re now the owner of a custom freestyle fin. The first rule for fin selection is that if you are using a bigger sail, use a bigger fin. Naturally one wants to balance the two forces. Fin Size is often given in length ( inches or cm ) but since fins come in different shapes, length is good only for comparisons of the same styles of fins. A 12 inch weed fin is actually ‘bigger’ than a 14 inch slalom fin in terms power. For this reason area is a better indicator of a fins size, and the size of the sail it will work with. A very rough formula for figuring what size fin you need is to multiply the area of the sail ( in square meters ) by 50. This gives a midrange fin area in cm2. This is only a starting point. The board size and style, rig type and tuning, water conditions, sailor ability and style, and the kind of windsurfing being done will all affect the fin size and selection. Fortunately, one can usually just check the manufacturers chart for a more detailed recommendation. Boards will usually cover more wind and sail combinations than their stock fins permit. Of course there are limits – a big fin won’t make your 253 wave board work with an eight meter sail. The limits are mostly volume, rocker line, tail width, and footstrap placement. The wider the placement of the footstraps from the centerline of the board, and the wider the board itself, the more fin it can handle. The fin shape presents another set of variables. The most important are the aspect ratio – how narrow a fin is relative to length, and the template – straight up and down, or curved back. A vertical fin goes faster up wind and planes sooner, while a raked back or swept shape improves high speed control and tracking in the turns. A narrow blade is fast, but more critical, while a wider one has more low-end power. For this reason, a slightly fatter than average fin works better on longboards and for marginal conditions. For slalom boards on a plane, an aspect ratio of about 4 to 5 is best for most conditions. Wave sailors aren’t so concerned with top speed since they won’t go in a straight line long enough to reach it. In waves it is important to have a wide range of power and good control on all points of sail. Wave fins are swept back, and have an aspect ratio about 2.5. Bump and jump is sort of a cross between slalom and wave performance, so the fins are a cross as well. The a.r. is in the 3 to 4 range, with more rake in the tip than a slalom fin, but more vertical than a wave. Weed fins have a steep angle to let grass slide off. This costs some speed and pointing, but beats trying to sail with a glob of weeds on your fin. Boards have different style of bases, with most of the recent models using some type of through-hull design for strength. There are adapters available to convert one blade to different style bases, but this does compromise strength somewhat. Adapter bases are not recommended on fins 40 cm and longer. You must buy a fin to fit your board, but the pros and cons of the most popular fin systems are listed here. A and E boxes are the oldest style. The fin is mounted from the bottom. The two systems look the same, except that the E base is a little deeper. They are weak, but offer adjustment, so they are still used on some wave and convertable boards where strength is less important than exact fin placemant. Widely used on older boards. Tuttle is the original and strongest of the through hull systems. It uses two bolts from the top. Found in many custom and race boards, especially in larger sizes. It is well suited to the high loads created by big race fins. Powerbox is the system used by Mistral and F2. It is a through hull box with a single central screw. It is not as strong as the others, but adequate for mid size fins. The fin is not as firmly mounted either, so the fit must be more exact, but it is convenient to change fins via the single, lever operated screw. Trim or Power Trim is the Bic and Fanatic box. It is the only through-hull box where the fin position can be adjusted. This can be a big help to fine tune the handling of a board. The fin is held in by a tab and one screw, so it is easy to change fins, but more secure than the Powerbox. Tiga created it’s own conic system, with two bolts at first, then a horizontal pin in place of the front bolt. A very strong and convenient system, but not widely used. The newer Tiga fins work on the old 2-bolt boxes, but the old fins must be modified to fit the new boards. The 1998 Tiga FreeR boards use the Trim box instead. Other fin systems exist. Old Windsurfer brand boards had a proprietary box that is no longer used. Magnum boxes are found in a few custom boards. They are like a ‘heavy-duty’ E-base. 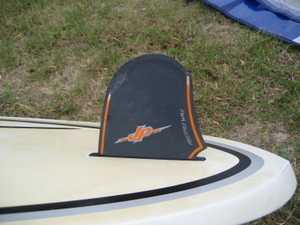 Some wave boards use side fins which may go in one of three different surf board boxes, a shortened A-box, or even be attached permanently to the board. Fortunately these odd-ball systems are few and far between. Fin materials vary depending on cost and application. Plastic was once prevalent, but since it is weak and soft it is not suitable. Fiberglass was next. It is easy to work and inexpensive, but heavy. It is still used, especially in wave fins, It works well in lower aspect designs where great strength is not needed. G-10, an epoxy laminate, was originally created for electrical circuit boards, but is now widely used for fins. It is low cost and easy to grind into shape. It has a flex that gives a nice feel to mid-sized fins. Drawbacks are a lack of consistency from batch to batch, fatigue characteristics that may shorten the useful life of larger fins, and weight, which is fairly high. Carbon and carbon composites are light and very stiff, so they have been used in fins, but there are many drawbacks. Carbon is very brittle, so it shatters on impact, it has a high cost, is hard to finish smoothly without heavy coatings, and is too stiff to ride well. The best fin materials are probably those engineered specifically for the job, such as the Profoil VTR used by Fin Works. By molding, rather than grinding, a very consistent shape is achieved. Because fiber composition and orientation can be controlled, it is possible to optimize flex in all directions. The high fiber to resin ratio produces a stronger, lighter, and longer lasting laminate with a smooth finish. It is not much use to have an expensive fin if the foil is rough from dings and scratches. Even a little nick can cause drag. Keep the foils in good shape, use sandpaper as needed to remove small dings. The front should be rounded slightly, while the trailing edge should be crisp, but not dangerously sharp. A 400 to 600 grit wet-sanded finish is best. New fins should be scrubbed to remove mold compound. Never wax or polish a fin, as too slick a surface can cause spin-out. 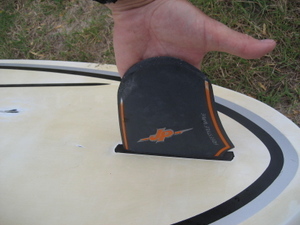 The fins on a windsurfing board are an important consideration of intermediate board performance in various wind and water conditions. Beginner boards have larger fins designed for ease of use through lower-drive mass. Intermediate windsurfers are much lighter on their feet and get better responsiveness from smaller fin dynamics. Not only should you select your first windsurf board based upon maximizing length of usability but your first consideration should be determined by your body weight. This is also true as your skills progress when determining which fins will perform best for you. When learning about the different fins used on a windsurfing board you will need to determine your ultimate goal for making the fin change. You should factor in the normal wind conditions in your area. Then decide if you want improved performance during normal planing, increased speed or handling in moderate wind conditions, or all-out speed for radical blasting and over-power conditions. Your level of competence also should help you make this decision. Don’t get too far ahead of yourself. You should also factor in sail size most commonly used and your board displacement number. There is a guideline for selecting the best fins on a windsurfing board as skills advance. When using a large short board your first fin swap should be with a fin in the 34 to 38cm range. These are the fins most suitable for windsurfing off the plane. It is possible to carry various fin sizes, along with your sail quiver, when you go to the water. Sometimes it is much easier to simply change your fin to one of a few centimeters larger or smaller to enhance performance in over or under powered situations. This can in many instanced solve the problem without the need to change your sail and allows you to get back out on the water much faster. For blasting performance remember that the fins must work well with your sail size. If you change your fin to match the conditions and tune up performance, the fin size must be only be a few millimeters different from the fin that you remove. Larger fin size differences require sail changes also. Talk to more experienced sailors for advise when you have advanced enough to make more drastic fin and sail performance changes. Board fins are a great deal smaller than those normally used on beginner boards, Many intermediate freestyle sailors make their own fins themselves either totally by hand or by grinding down a larger fin that already fits their board. There are many manufacturers who produce fins for a variety of different and specific uses. Remember when determining fin size for planing performance purposes that when you are using a big sail, you need a bigger fin. When really blasting across the water your daggerboard is up and you are planing (skimming) on the water. Your sail is leaning back over the fin. And when everything works right, what a blast! The fins that come “stock” with today’s boards are significantly improved over even a few years ago. Often the stock fin will be just the ticket for most of the conditions that the board was intended for. However, to maximize the performance range of any board, you may want to add a second (or even third!) fin. In some cases the stock fin may be a bit small for the average sailor. Ask one of our fin experts for advice on adding another fin or two. It can often be the least expensive way to upgrade and expand the performance of your board. When your fin is too big for the conditions, it will generate too much lift, reducing board control. When your fin is too small, you will have problems going upwind or getting on a plane. And you will feel your tail slipping, or skidding sideway. Your ability to go upwind will be compromised. Sailing in lighter wind conditions, such as freeriding, you can get away with 4-6 cm between each fin size. But in the waves or in hi-wind sailing 1-2 cm can make a big difference. Span (length): The dept of a fin is measured vertically from the base of the fin to the tip, excluding fin box. Maximum cord length: The widest point on the fin. A fin that is wider will help get you planing earlier. Rake angle: The angle a fin is from vertical. A fin with more rake is usually more maneuver-oriented and smaller than a more upright fin. Most surf and high wind fins have a pronounced rake angle. 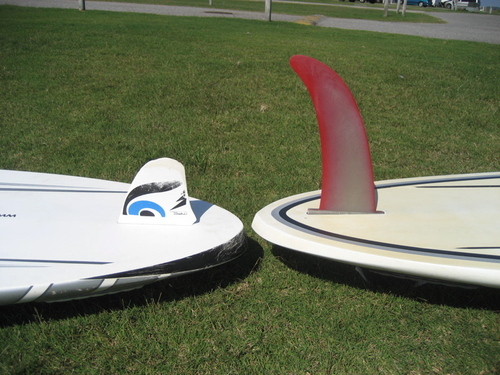 Larger, more upright fins offer better light air and upwind performance. Trailing edge: The back edge of the fin. Welcome to WindsurfFins.com, the best source for all the information you need on windsurfing fins. Find articles, reviews, stories, tips and more.